Exploring the growth in demand for such packaging and considers how this simple container has proved its value. Until the 19th century, shoes were generally made by hand in small workshops by cobblers. As this footwear was made to a customer’s specific order or in limited quantities, there was no great need for shoemakers to create significant storage space or require adequate ways to protect their goods. However, rapid development of innovative manufacturing processes within the footwear industry soon required good storage for the newly mass-produced product. Some sources claim that the first thick and durable paper that could be called ‘cardboard’ was invented in China in the 15th century, and that boxes made from this material were first mass produced in England in 1817. The first commercially-made cardboard boxes were simple affairs, formed from a single layer of brown cardboard likely covered in white paper. These were very useful for storing products in retail establishments, but they were not strong enough to withstand continual handling. As with many stories about clever ideas, the next step in the evolution of the shoe box involved putting an existing product to an alternative use. Two English inventors – Healey and Allen – were awarded a patent for pleated paper in 1856. This was produced on a simple hand-cranked device that shaped the paper between a fluted roller and a similarly shaped base plate. This ‘corrugated’ material was used to line men’s tall hats of the day. In 1871, Albert Jones of New York City patented his design for corrugated board with a single paper face which was used for wrapping glass bottles. Some four years later, a machine was designed and built to produce large quantities of single-faced corrugated board. Also in 1875, Oliver Long produced corrugated card with paper on both sides of the fluting. The strength achieved soon led to reinforced boxes being made from his patented material. However, as this was still a reasonably expensive method of packaging, such boxes were initially reserved for higher-end breakable goods such as glass and pottery. Taking the process a step further, Henri Norris began to manufacture double wall sheets comprising of two fluted layers sandwiched between three sheets of paper, and by 1890 cardboard boxes had also became the preferred packaging for fruit and fresh produce. Having emigrated to the USA in 1839 at the age of 14, Scotsman Robert Gair opened a factory producing paper bags in Manhattan in 1864. As the story goes, Gair discovered that he could make prefabricated cartons by cutting and creasing paperboard in one operation, and by 1879 he is said to have developed a technique for the mass production of cardboard boxes. The Robert Gair Company began to manufacture corrugated cardboard shipping containers in the USA in 1895, and this reportedly made him a very wealthy man. The material would be cut to shape and scored, and the box and lid would be folded to shape after which the corners were held together with ‘stay’ tape (and sometimes stapled for added strength). The base would then receive a band of plain or fancy paper coated with glue around its sides, which would leave the brown card visible at the bottom of the base, and the top of the box lid would also be covered with paper. The covering paper was always turned in to the inside of the base and lid, so that no rough edges could be seen. Early in the 20th century, footwear became a fashion item for the general population rather than simply a practical necessity. Gradually, the shoe box came to play an essential role in point-of-sale packaging, and featured illustrations of the footwear as well as corporate logos. At the outset, footwear producers used the overall colour of the covering paper as their corporate identity. Shoe manufacturers needed to get their products onto retailers’ shelves, so demand increased on the box makers to provide ever-larger quantities of different-sized containers in many colour variations. This led to significant investment in new machinery, including platen press die-cutters and automatic paper covering machines. Large paper covering machines were designed to accommodate 4½-inch deep boxes, which meant that most sizes of shoe box could be manufactured with this same process. Many millions of paper-covered shoe boxes were made while they were the storage of choice. Mail order companies used another cheaper variety – a brown corrugated box with no paper covering. During the 1980s, a new style of shoe box became an option. This alternative was manufactured from cut and creased solid white board. It had corner flaps which were glued and, while not as robust as the paper-covered box, was cheaper to make. Some shoemakers started to produce their own boxes rather than buy them in as finished items. These would be delivered as flat, die-cut pieces that could be glued up as and when required. Suddenly footwear producers were no longer reliant on timely deliveries, they had more control over stock, required less storage space, and enjoyed a lower unit cost. The new glued-up box arrived at the retailer in a good condition, but by the time it had been pulled off the shelf (usually by its lid) and pushed back in a few times, the box began to disintegrate – especially at the lid. A compromise was found, involving a glued-up box base with a paper covered lid. 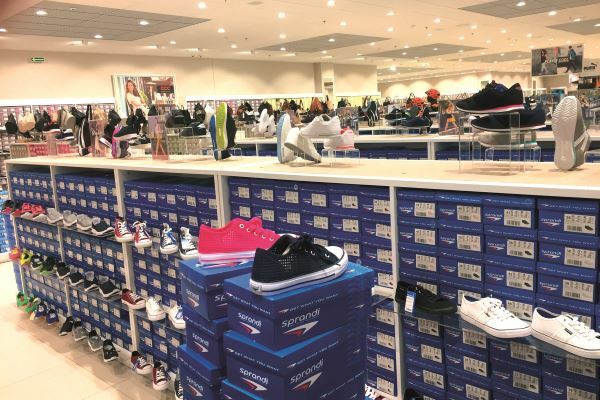 Then in the mid-1980s, marketing experts encouraged shoe shop owners to display their footwear in a more ‘up-to-date’ manner, simply using rails and shelving rather than presenting rows of boxes with their labels showing. The reaction from established high street independents was described as one of ‘horror and disgust’, but this recommendation soon took hold and forced the shoe box into the hidden stock room in many retail establishments. 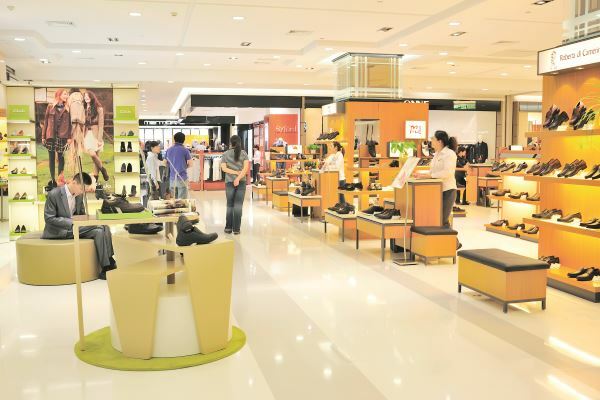 Today, there is a distinct split between shoe stores which hide any sight of a box from consumers until they try on a particular size, and other establishments which keep the boxes in display in the retail area. Also in the 1980s, Western footwear manufacturers started to suffer as a result of aggressive competition from foreign imports. For example, many UK-based box manufacturers suddenly faced the disappearance of their local customers as shoemakers moved their plants overseas or ceased production altogether. Most of these box makers had to adapt or die. Some, for instance, went on to become suppliers of rigid paper-covered packaging to the education, software, and toys and games industries. Today, shoe boxes are available in an incredible array of shapes and sizes, and they are made from a variety of materials, including corrugated and non-corrugated card, fabric and plastic. Modern boxes also provide different stacking and storage options. Unless they are stored individually on angled shelves (which may be deemed wasteful if space is at a premium), traditional top-open boxes – whether the lids are the lift-off or hinged variety – require the shop assistant to unstack several boxes if trying to get to shoes on the bottom of the pile. Alternative box designs feature a drop-down front or pull-out section that allow footwear to be taken from boxes without having to unstack them, although these are still less common than top-opening types. The use of shoe boxes is recognised as an ideal way to store and organise footwear at home, as well as in the shop. The original boxes in which the footwear was sold are often utilised at home to care for a shoe collection. In addition, new boxes – more often than not made from plastic – are readily available for purchase online. The traditional cardboard box is still by far the most common container used by manufacturers to house their footwear while it journeys to the final customer. Particularly when facing a long journey, the quality of the box is of paramount importance to ensure that the product reaches its destination in pristine condition. As a result, SATRA has developed a specification for shoe boxes that assesses physical strength (to avoid crushing that could damage the shoes), colour fastness, chemical constituents and moisture absorption. An in-depth consideration of these important characteristics was published in the article 'Assessing cartons and cardboard boxes'. 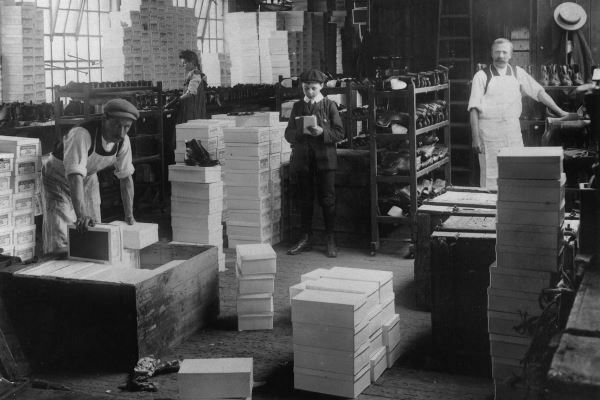 The photograph at the top of this article shows footwear being boxed up in the early part of the 20th century. Please email footwear@satra.com for assistance with the testing of shoe boxes. This article was originally published on page 40 of the December 2018 issue of SATRA Bulletin.